Vacant land - PENNINGTON, NJ Attention Developers, Farmers and Entrepreneurs! 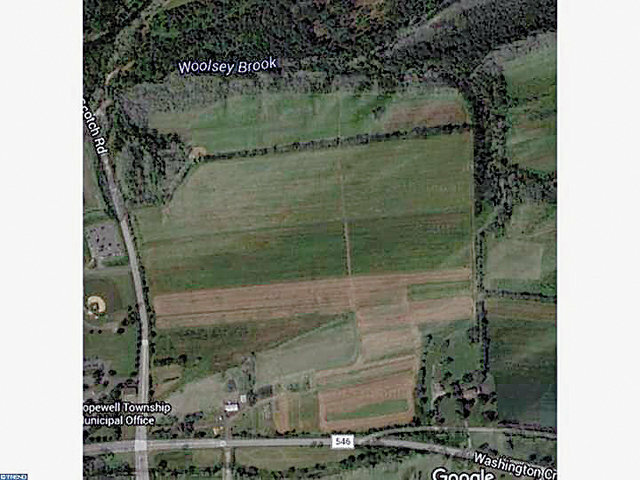 LARGEST contiguous property left in Hopewell! Over 133 Acres of beautiful farmland with endless possibilities. Phenomenal location! The total property consists of 5 lots, 1 includes the farm house on 2 acres -- the farm house is in need of total restoration, other lots are 32.18 acres + 13 acres + 53.35 acres + 32.17 acres. Conveniently located to Rt 95/295, Trenton Mercer Airport and Capital Health Hospital. 45 minutes from Philadelphia and 1.5 hrs to NYC. A public water line comes to the corner of the property at Scotch Rd and Rt 546 -- fire hydrant. A natural gas line runs the length of the property along Rt. 546. The farmhouse is on the National Historic Register and is called the Hart Hoch house. It was originally built for John Hart's son -- John Hart was a signer of the Declaration of Independence. The original house was built around 1758 and then added on in the early 1800's during the Federal Period -- a distinct time in housing architecture. The bricks used to build the house were made in Ireland and came over as ballast in a boat. The Hoch's have farmed the land for four generations. Hunting opportunities include; deer, turkey, geese and small game. The barn is a metal Morton building (45x75) and consists of 5 tractor trailer bodies for storage, 6 tractors and various agricultural implements and mowers are available. 30x100 XS Smith Greenhouse with heater, fans and growing tables. Traffic volume is conducive for retail -- especially a farm market. This is a magnificent location and a must see for the visionary!